Well, I have a new book coming out. It is scheduled for release this Halloween. It marks the first novel that will be published through Founders House Publishing. The book is called Autumn Sky and is a collaborative effort with fellow writer Brent Pasley. It is a paranormal western. Here is a short summary: There are many dangers on a wagon train headed towards the goldfields of California. Veteran cavalryman and guide Abel Carter leads another group west through the Kansas Territory when strange and terrible things happen. Ghosts haunt the prairie and a menacing, supernatural presence has awful designs for Carter. Will he survive the darkness? Will anyone? 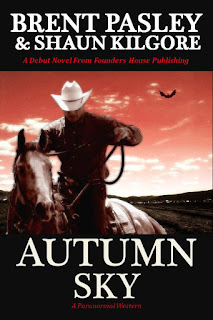 Autumn Sky will be available as both an eBook via Kindle, Smashwords, Nook, iBooks, and more. It is will also be available in print. Those interested can purchase copies on or after October 31, 2011. You should check it out.